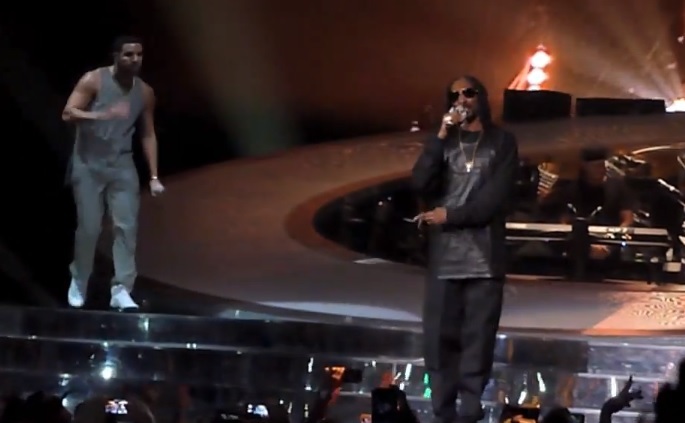 VIDEO: Drake Brings Out Snoop Dogg In L.A.
Drake’s “Would You Like A Tour?” recently stopped in Los Angeles and the YMCMB rapper decided to treat the Staples Center crowd to a special performance from Snoop Dogg. The Long Beach native and hometown hero hit the stage in the middle of Drizzy’s set and performed a couple of his classics like “The Next Episode,” “Gin & Juice” and “Drop It Like It’s Hot.” Take a look as the Doggfather almost takes a bad spill right in the beginning as he makes his way down the stairs. This entry was posted in Live Performance, Video and tagged hip hop, Los Angeles, rap, Snoop Dogg, Snoop Lion, snoopadelic, snoopzilla, Staples Center, would you like a tour. Bookmark the permalink.